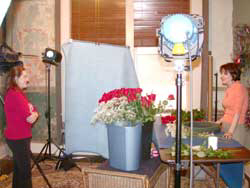 In a patriotic-themed program to air on April 17, 2006, P. Allen Smith Gardens asked FlagandBanner.com’s founder and owner, Kerry McCoy, to create a fresh-flower arrangement to celebrate the USA. Kerry chose red American Beauty roses and baby’s breath to build a gorgeous live wreath and topped it off with a stars and stripes bow. Kerry shows how easy it is to create an elegant and impressive way to accent your patriotic celebration. Use yellow roses to create a stunning welcome home tribute for a brave soldier. In the above photo, Mandy Stanage Shoptaw, producer for the P. Allen Garden show, directs Kerry in the proper method to address the camera. 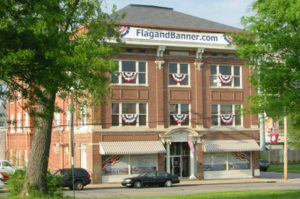 The segment was shot on location at FlagandBanner.com headquarters. 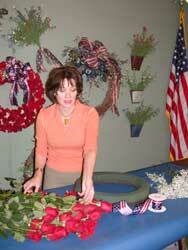 In the photo at left, Kerry cuts a rose to begin the wreath (a finished wreath can be seen behind ber, to her right). This entire project can be completed in less than one hour. Stay tuned for Kerry’s next appearance on P. Allen Smith Gardens airing close to Flag Day to learn helpful flag-flying tips and more about the patriotic offerings at FlagandBanner.com.